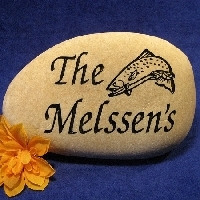 Engraved rock art is always a unique choice when looking for a gift for a special occasion, a memorial which will last for ages, or an addition to your home or garden d�cor. From small pocket-sized keepsakes to large entryway greetings, there are so many ways to incorporate rock art into your world. But what goes into selecting just the right piece? It�s simpler, and yet more interesting than you might think. Engraved �stone� can actually be made of many things, from natural stone, to glass, to composite materials made in a lab and set in a mold (often called �resin�). Selecting the right material depends upon your purpose. Composite stone may be a bit cheaper, and if well-made will certainly last as long as natural stone, but it may not be as meaningful (or look as natural) as hand-selected river rock. Whatever you choose, be sure any natural stone was ethically harvested, and that any molded resin is made of material that will withstand weather and time. When it comes to engraved stone art, size matters. And the appropriate size, of course, depends primarily on the piece�s intended use. Small stones (the kind you can fit in the palm of your hand) make for great wedding party gifts, engraved with the couple�s names and wedding date or a word or symbol meaningful to the happy couple. They also work well as comfort stones for an ill or grieving friend, as well as inspiration for someone facing a difficult test, opening a new business, or otherwise embarking on a new life goal or adventure. Medium to large rocks are typically the size used for display. A memorial stone (to mark the grave of a beloved pet or the site where something tragic or important took place) is typically of medium size. This size is also good for garden stones used to identify certain perennial plants or as inspirational focal pieces. Home entryway stones, however, tend to be quite large as they are meant to catch the eye of approaching guests. Engraved rocks are meant to communicate--to portray a message in words or symbolism. You may already know exactly what you want your engraving to say, but if you are unsure most rock engravers will help you with your design. Many engravers have a catalog of symbols and lettering fonts to choose from, as well as color options (if they paint or emboss their engravings). For a wedding gift, you might choose wedding bells, a dove, over-looping rings, or a bridal veil and top hat (very vintage) to go along with the couple�s names and marriage date. In the end, picking out rock art is a personal journey, and one to be taken with intention and gravity. These engravings can last a lifetime, and may even be passed down generations. You want to make sure you take some time and select just the right thing. After all, whatever you choose will be written in stone. Why do British movies look different?